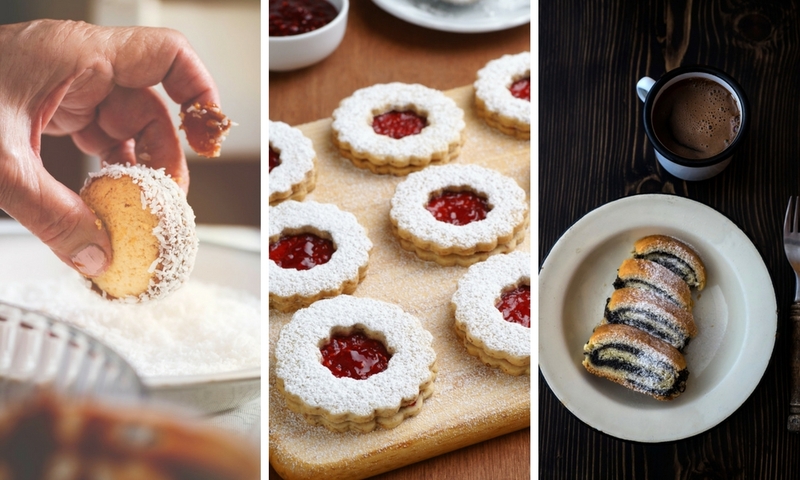 Bakery cookies in Israel are as diverse as the Israeli demographic, drawing inspiration from a whole melting pot of cultures. Don’t expect monstrous, American-style chocolate chip cookies on the menu — Israeli bakery cookies are meant to be small, sweet bites to accompany a good cup of tea or coffee. So sit back and get excited to go on a global tour of flavors like dulce de leche, tahini, and just about everything in between. 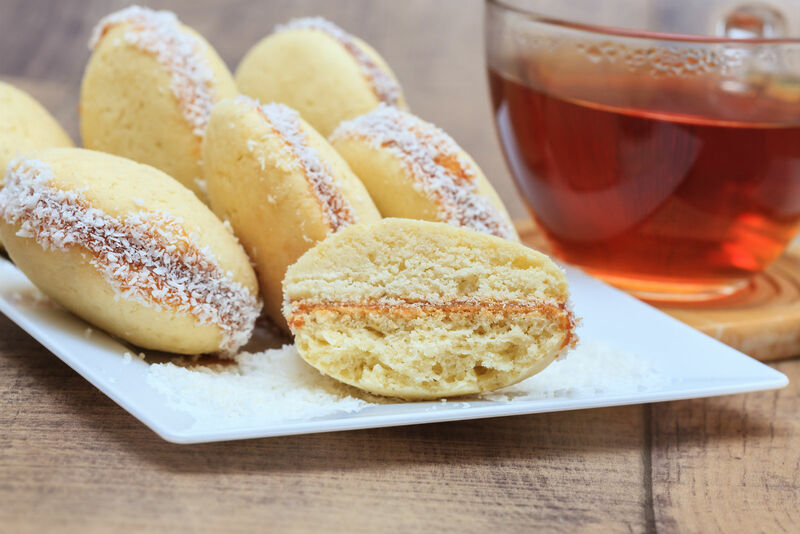 Alfajores are a heavenly Argentinian shortbread sandwich cookies brought to Israel by the some 50,000 Argentinian immigrants who have settled in the holy land over the years. They have become an Israeli bakery staple largely due to just how darn delicious they are: rounds of crumbly shortbread (often made extra short with the addition of cornstarch) that are filled with a thick layer of caramel, or more accurately, dulce de leche, and then rolled in coconut. The original, mass-produced alfajores were actually coated in a layer of chocolate (there is still a kosher version that exists today) but a chocolate coated cookie is not particularly realistic for Israeli weather, and so it isn’t particularly popular. Savory cookies may sound strange to find in a bakery otherwise filled with sweet goodies, but they are quite common throughout Israel, a country with a deep love of savory pastries (like bourekas, yum). 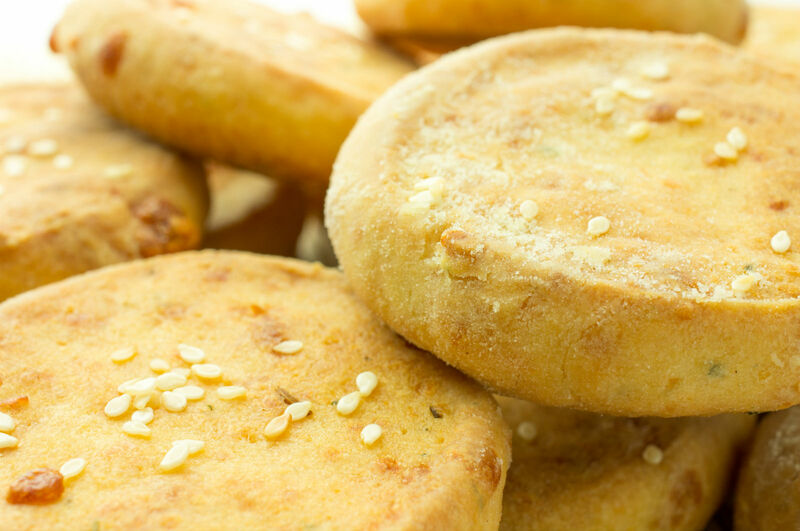 One popular savory cookie you are likely to find are Parmesan shortbread cookies, often made with leftover cheese from the bakery’s other savory treats. Another cookie from this category is the popular savory Moroccan cookie, often just referred to as salty sesame cookies, or Abadi cookies, after the popular brand you’ll find in the supermarket aisle. These are identifiable by their small “O” shape and telltale smattering of sesame seeds. And yet another common savory bite are cookie-crackers topped with Nigella seeds, or mixed with herbs and/or Parmesan cheese. Whatever version you come across, know that they will most definitely make a great addition to your party spread and pair perfectly with wine. These sandwich cookes are more widely known around the world as Linzer cookies (oogiot sandwich riba) and unfortunately, they are usually made with bright magenta-colored industrial jam from a bucket. 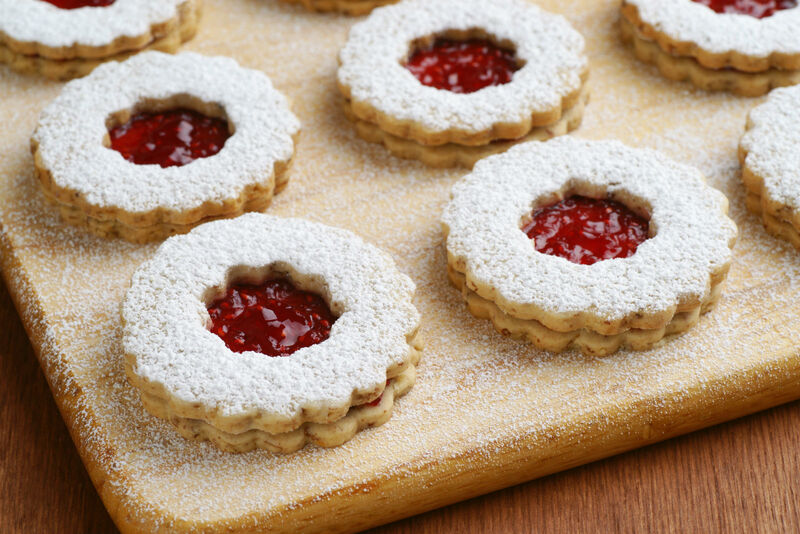 These simple little cookies, with a peekaboo cutout from which jam peaks out, are dusted with a fine snow of powdered sugar and are a product of Austrian influence. 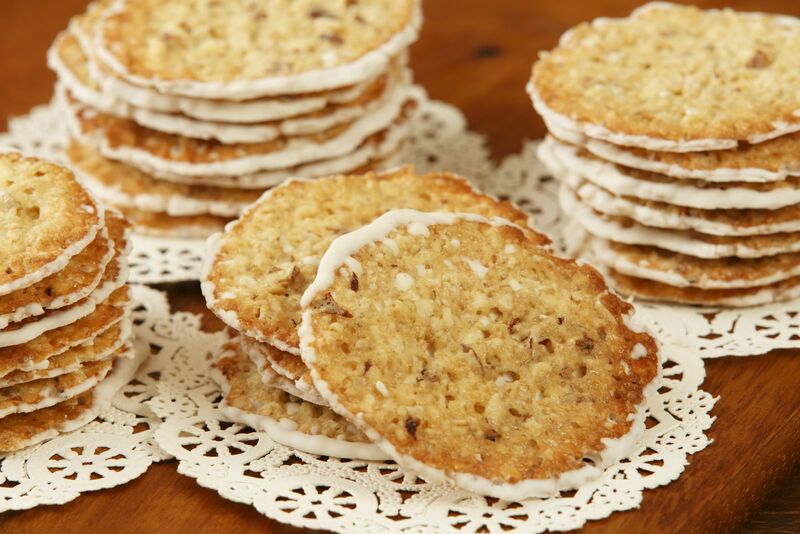 Eastern European Jews were among the first Jews of modern times to populate Israel in the late 1800s, and so these beloved cookies have stood the test of time as a bakery staple. 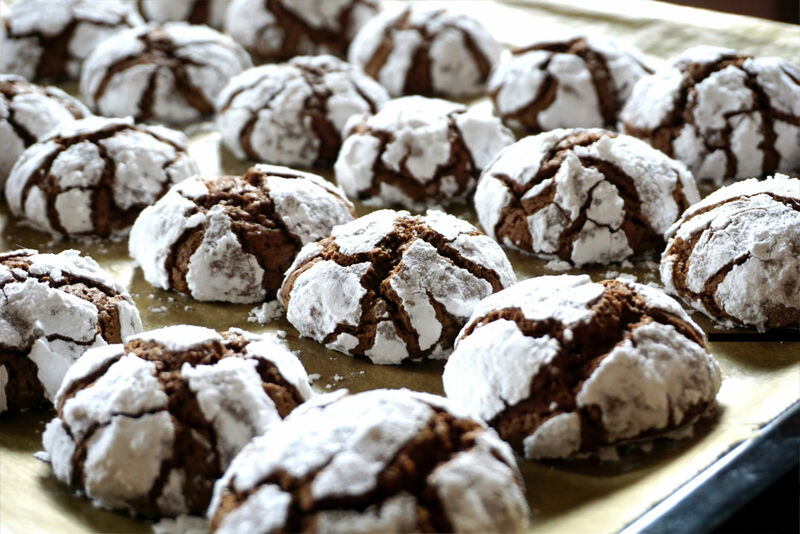 You might know these classic treats as chocolate crinkle cookies. The Israeli version is like a teeny tiny powdered-sugar covered brownie. They can be called snowballs (an odd name for a place that hardly ever gets snow) or more appropriately sla-im (Hebrew for “boulders”). While the origin of these cookies is debated (is it American-born? Is it originally a German cookie? ), we’re guessing that it’s also part of the traditional European cookie club that made its way to Israel via good old immigration. 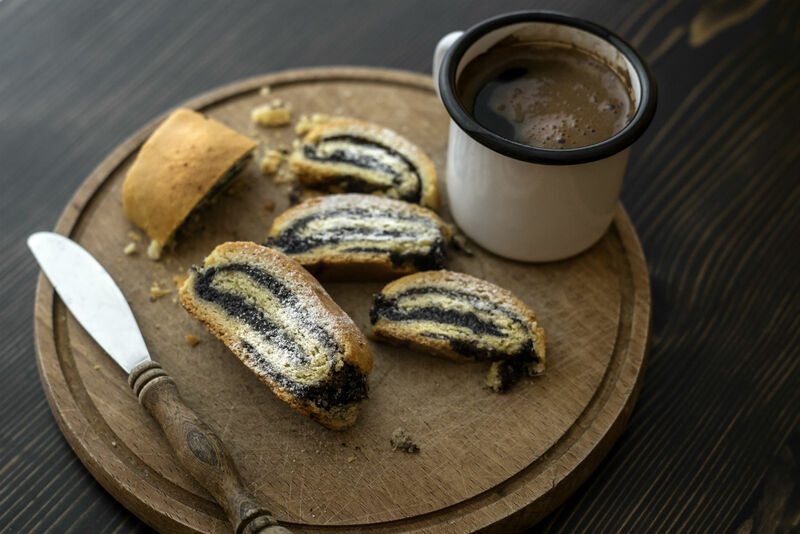 The Middle Eastern baby of a strudel cookie and a rugelach cookie, date “shtrudel” cookies are often called ruladet tmarim (date roll). These rolled treats are like the most fabulous grandma cookie you can imagine. Made from a buttery shortbread dough, spread with warmly spiced date spread, and sometimes sprinkled with chopped walnuts, then rolled up and cut into homey looking swirled cookies, they will be the first thing you think of when you need some old-fashioned cookie comfort. These fancy European style cookies (which are also common in many American bakeries) are made from almond slices and held together with a goopy candy-like syrup that sets as it bakes. Sometimes they are even a topping for a shortbread cookie, and sometimes they are the cookie themselves. All we know is that they are a life-saver for that one gluten-free friend/travel partner with the insatiable sweet tooth. Another Middle Eastern version of a Christmas cookie, crescents, or horns as they are referred to in Israel, are the perfect answer to the Israeli bakery’s nut fetish. In fact, nuts play a prominent role in many Israeli baked goods: walnuts, almonds, and pistachios often take center stage in Israeli desserts. Nut crescents might remind you of a pecan sandy cookie, since the nuts are ground and added to shortbread dough. They are a delightful, not overly sweet treat perfect for your afternoon cup of tea or coffee. 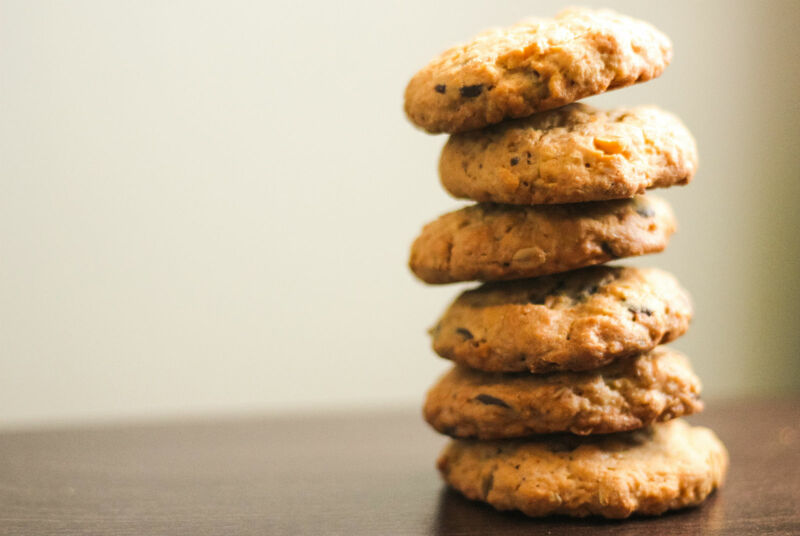 Forget oatmeal cookies, granola cookies like these ones here are the healthier version of this classic cookie that you’ll find boxed up on the Israeli bakery shelf. They are usually small rounds that are a bit crunchy and stuffed with nuts, seeds, and even a dried cranberry or two. Is it granola? Is it a sweet? We’ll just call it fuel you can enjoy on the run, which actually makes a perfect tribute to the healthy way Israelis tend to eat, anyway. Tahini is a common ingredient used in both sweet and savory dishes throughout Israel, so it’s no surprise that tahini shortbread cookies are so popular here. They are often topped with additional sesame seeds, so it’s unlikely you will be confused about their identity. There’s no question that these cookies are of Middle Eastern origin, but as with many other popular foods like falafel and hummus, it’s not easy to tell where the line is drawn between immigrants recreating their home cuisines (after all, nearly half the country is made up of people who originated from Middle Eastern countries), and mixing with the local food culture. You can often find these wafer thin, crunchy almond biscotti stacked-up neatly in the cookie boxes at Israeli bakeries. 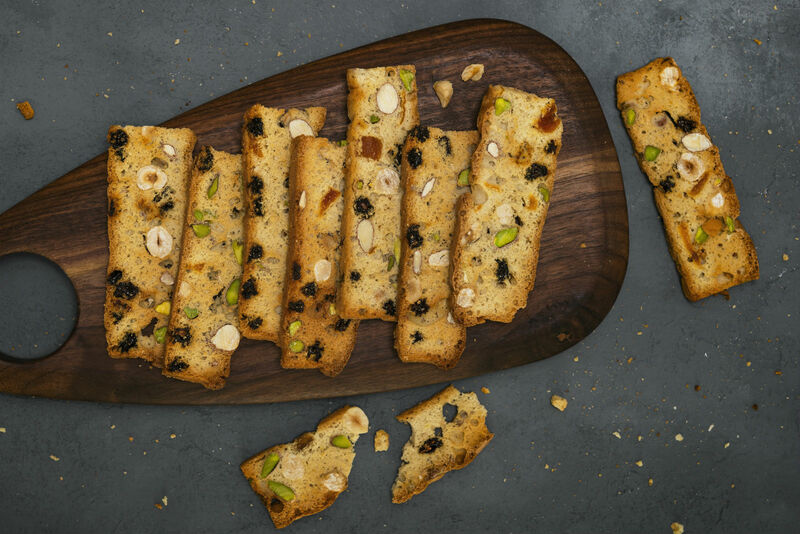 Showing off just how beautiful sliced almonds look in profile, and making a case for rock-hard cookies that last forever in your cabinet, these are perfect for when you just want a little almondy crunch with your afternoon tea break. Also check out the many versions that show off Israel’s extraordinarily plump dried fruit selection, which are especially popular around Tu Bishvat.